Allen's Farm AD plant with HRS Twin-Tank pasteurization technology, in Essex, England. • The increasing use of anaerobic digestion: There are currently around 250 on-farm AD plants in the United States, but there is believed to be the potential for as many as 8,000 on-farm plants nationally1. Such an increase in the use of this technology will also increase the amount of digestate produced, meaning that more land will be treated, and the greatest levels of safety will be required. 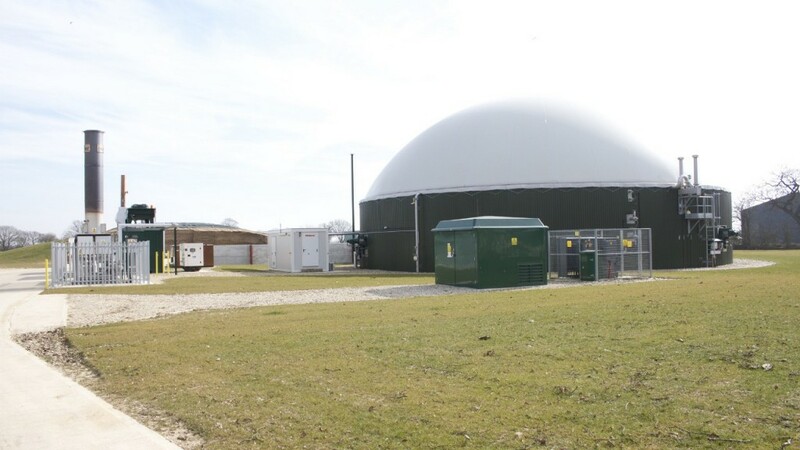 • The increasing use of food waste for anaerobic digestion: As AD becomes more widespread as a method of food waste treatment, the amount of digestate produced from non-crop sources will increase accordingly. Such material will need suitable treatment if it is to be applied as a fertiliser or used for other purposes such as landscaping, soil improvement or manufacturing. • While research suggests that certain plant pathogens and weed seeds, such as tomato or black-grass (Alopecurus myosuroides), are not always destroyed by mesophilic anaerobic digestion at 99oF, pasteurization has been shown to effectively control most plant pathogens and seeds2. In Europe, pasteurization is more or less the standard treatment for food- and waste-based AD plants. Some farmers also choose to go beyond what is required by waste legislation and use pasteurization as part of their anaerobic digestion process even where crops from their own holdings are used as the feedstock. One such plant is Allen's Farm near Colchester in Essex, England. The company grows around 300 acres of onions, 300 acres of potatoes, 1,000 acres of cereals and 500 acres of corn for its biogas plant. Crops and crop waste from the farm fuel the Allen's Farm AD plant. Three years ago they contacted Fullcircle Energy Ltd to upgrade their existing 499 kW AD plant by installing a HRS Heat Exchangers Twin-Tank continuous batch pasteurization system. The plant, supplied by Austrian company Thoeni, is fuelled with energy crops, and 8,820 tons of farm waste and by-products such as brewer's grains. The biogas produced is burnt in a combined heat and power (CHP) engine to produce electricity for the distribution grid, powering more than 600 homes and saving more than 1,760 tons of CO2e emissions each year. "The idea of pasteurizing is that we can feed more by-products and waste from our potato and onion crops into the digester. We can then put the digestate onto our land without worrying about potential issues with weed seeds or spreading crop diseases. It will also remove the need to obtain a permit to spread the digestate, which can be very onerous. "In turn this allowed us to double the capacity of our plant and run two digesters rather than one, and we will then be able to export the electricity directly to the nearby University of Essex." The HRS Twin-Tank pasteurization system was chosen as a batch system was required, rather than HRS Heat Exchanger's more commonly supplied Three-Tank System. The Twin-Tank System is an ideal choice for farms with space constraints: it uses the same technology as the popular HRS Three-Tank technique but its compact design reduces the physical footprint of the system by a third. The system at Allen's Farm includes a primary storage tank before the pasteurizer as well as a post-treatment storage tank which feeds the treated digestate into a lagoon for longer term storage. When first commissioned in December 2015, the unit treated around 1,060 cubic feet of digestate sludge each day, but it was designed to cope with twice this amount once the plant had increased in size. The HRS pasteurizer uses a double tube heat exchanger to heat the digestate, which contains up to 14% dry solids, to 167oF. This allows for variation in the sludge consistency and its incoming temperature, making sure that the digestate is always properly pasteurized. In order to maintain a constant throughput, while one tank is being filled, the other is heated, pasteurized and emptied. The tanks can also be used individually, for example to allow for routine maintenance. "This Twin-Tank version of our widely used HRS Three-Tank pasteurizer brings all the benefits of the established system, but in a more compact package. We can see it being of particular interest to smaller plants, farmers and those who want to increase the efficiency of an existing plant where there is limited room to expand. "This particular Twin-Tank pasteurizer has been carefully designed to allow Allen's Farm to expand their biogas operations, not only by providing sufficient treatment capacity for the enlarged facility in the future but, more importantly, by allowing a wider range of waste feedstock to be used in order to fuel the planned expansion. "As the demand for pasteurization at on-farm AD plants increases in the United States, having access to a variety of options including specifically designed twin-tank and three-tank units, means that farmers and plant operators will be able to select not only the most appropriate technology for their situation, but also the most cost effective solution."